As Wimbledon fortnight was drawing to a close, Jonny became the Number 1 Swede out in Kristianstad. After learning the Asum circuit on Wednesday, he topped Thursday’s Timed Qualifying session quite comfortably ahead of his Forza team-mates Alexandros Kattoulas and Dexter Patterson. This gave all three British drivers good grid positions for Friday’s heats. Friday morning started well for Jonny when he won the opening heat ahead of Dexter and Alex. The French driver Gillian Henrion finished 4th. Heat 2 produced another victory for Jonny, followed this time by Alex, with Dexter in 4th behind. Frederik Kikkenborg of Denmark. Unusually, there was no racing scheduled for Sunday with all finals concluded on Saturday. Jonny started the Pre Final from pole position, eventually claiming another fine win ahead of Patterson and the Russian driver Ilya Morozov. He retained his 100% record by winning the main event with Morozov initially taking 2nd place. However, the Russian ultimately incurred a time penalty that elevated Dexter into 2nd place. Sweden’s Caesar Kristiansson claimed the final podium place. 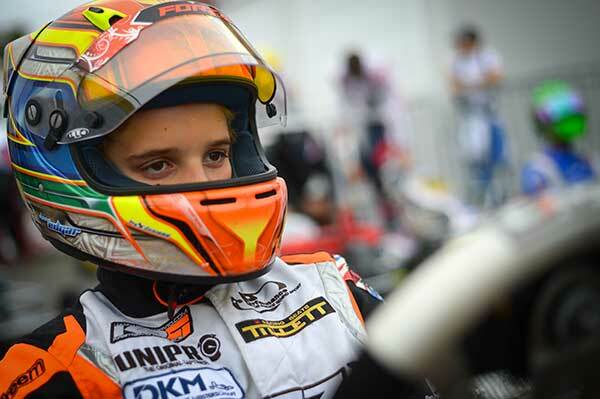 This event offered an opportunity for karting’s top stars to get in some practice before the European Championships reach their conclusion at Kristianstad on July 30th. Round 4 is being held this weekend at Alaharma in Finland. Jonny is currently leading the championships by 12 points over Germany’s O’Neill Muth.